Clay is so excited to be back in the beautiful state of Maine. He feels that Maine changed his life for the better. He met his wife in Bangor and joined an excellent fire department that took that flatlander in when he moved here. He also joked that he had to switch to NEWS CENTER Maine just so they could watch him, because it was easier than getting them to change the channel. Clay says it's an exciting time to be at a station that he admired when he was in Bangor and when he was working in Peoria, Illinois. Please reach out to him at clayton.gordon@NEWSCENTERmaine.com with story ideas and thanks again for allowing him the pleasure of broadcasting in Vacationland! 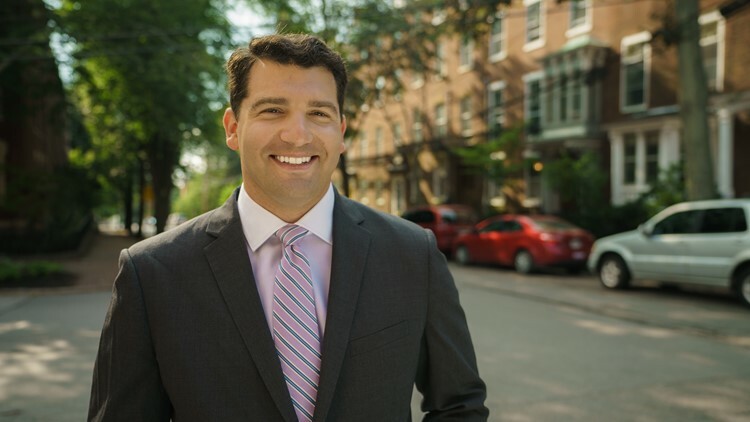 You can follow Clay on Facebook here and on Twitter @ClayGordonNews. A: There are many people that are responsible for me getting to where I am now, but the story I remember the most was running into Brian Williams in an elevator at a hotel in Chicago. He just finished a speaking engagement with veterans. I told him that I am an aspiring television journalist. He told me to find another career. Funny how things ended up…for both of us. Q: What would the book about your life be called? A: I have climbed Katahdin, which is remarkable, but I have never seen anything like Acadia National Park. Q: How does a pet brighten your mood on a bad day? A: Lindsey Mills and I have Tito, a long-haired Chihuahua/terrier mix. He is 4.7 lbs. He has three legs. There are no bad days with him because he is constantly melting our hearts. A: My first time going to Fenway was for a UMaine hockey game. Mic drop! A: The weird thing is that I know exactly the song I would pick. It stems from my baseball and hockey days. It is the chorus of the song “Ride” from Twenty One Pilots.